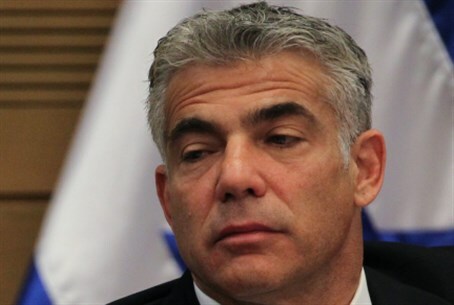 Finance Minister Yair Lapid ordered that all money transfers to Judea and Samaria be stopped, following a publication on Channel 2 claiming that money is indirectly passing from the state's coffers to Judea and Samaria's Yesha Council. The hold on transfers has been ordered until the claims are investigated. Far-left Journalist Amnon Abramovich claimed compensation money over the building freezes was sent towards the end of the last government in early 2013, but wasn't used for its original purposes of security, strengthening schools and kindergartens. Instead, he claims it was transferred "illegally" to the Yesha Council for "political needs," including opposition to government policy. That policy has included administrative orders arresting Judea and Samaria residents without evidence, trial or even an accusation of criminal activity, as well as "disruptive use orders" allowing the IDF to take Jewish land even with no Arab claims on it. The building freeze continues to rear its head around ongoing peace talks with the Palestinian Authority (PA). Plans for 24,000 homes were cancelled last November, although a building freeze was not an official pre-condition to the current talks. As noted, Lapid ordered payments to be stopped, and ordered the supervisor of the funds, accountant general and legal adviser to the Finance Ministry's office to check the claims and deliver findings within a week. Justice Minister Tzipi Livni announced she would investigate the issue as well, and noted that current Economics Minister Naftali Bennett was the Yesha Council Chairman the year the money reportedly was transferred to the council. Opposition Leader Yitzhak Herzog (Labor) said "whoever asks why the cost of housing keeps rising and the government stands helpless can find the answer in the unrealistic grants transferred to the settlements. Tens of millions of shekels that could help in the Negev and Galilee are passed secretly to the settlements." In regards to the cost of housing, it is worth noting that over 90% of Judea and Samaria is reportedly unpopulated, leading many to suggest that precisely funding and development of the area can solve the housing crisis. "I ask the prime minister and finance minister where's the money?" quipped Herzog. "I demand the state comptroller to investigate the findings to the end."